One of the things that almost everyone takes for granted is the benefits of a clean and uncluttered closet. We all have heard of The Chair, right? It’s a random chair in the corner of a bedroom that is draped with clean clothes – and sometimes not so clean clothes – and is used as a closet. The thing about the chair, is that it isn’t going to stop your room from being cluttered. In fact, it adds to the clutter! Having a good closet in the home is the way to ensure that you’re not constantly leaving clothes to get wrinkled and unkempt. When you do have a closet, though, you need to keep it organized, and there are closet systems that you can buy that will keep your closet looking neat and tidy – without much effort. The Chair can be a thing of the past if you have a DIY closet system that keeps everything you own in order. There’s no need to open the doors and have all the mess fall out, you just have to get up the motivation to get the closet as organized as possible – sooner rather than later, too. Organizing your closet doesn’t just mean organizing a large closet space; it’s often the smallest closets that have the most clutter inside them. With all of this in mind, check out some of our favorite options for closet kits that make sense. There’s something amazing about making the most of the space in your closet. You get that motivation to have a sort through, but then there’s nowhere to put everything that you want to store and hang again. With this all in one kit, you get a set that includes all the pieces that you need to keep your closet space organized properly. You can create a smarter storage solution for your clothes and accessories while optimizing the space that you are working with, such as sections where you can double hang your items. There’s a versatile layout and with easy installation, you can be organized in no time at all. This kit fits into any walk-in or reach-in closet with at least one 4-8ft wide wall, which means that you can design your space according to your vision. Still not sure that you’ve got the right size? 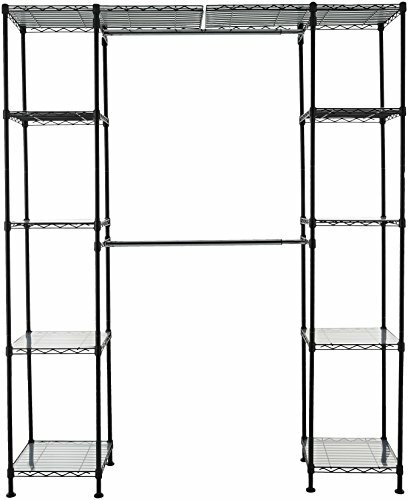 The telescoping rods and expanding shelves adjust to add 22ft of shelving space and 12ft of hanging space, which means that you’re not about to run out of room! You’re not left high and dry trying to work out how to hang everything, either, as mounting hardware is included for easy installation and there are instructions included to walk you through the installation process. With a maintenance free epoxy finish, you’re going to be able to enjoy your new closet, organized exactly how you’d like it to be. This adjustable closet organizer includes everything that you need to build a closet of your dreams. All you need is a closet space and the list of tools that you get given in the box, including wire shelving, brackets, closet rods, support road and all the hardware to make installation easy for you. The list of required tools and instructions are included, and there are no cutting or additional hardware required to start your project. As there is approximately 132 inches of hanging space and 216 inches of shelf space, you get enough room to add adjustable shelves to allow you to customize your space to perfection. There’s no need for clutter to overload your senses and cause you undue stress in all aspects of your life, and an disorganized closet does just this 90% of the time. You can take a moment to imagine walking into your bedroom and enjoying somewhere entirely stress free, because once you do you won’t be able to look back. The adjustable shelves mean that just because you set it up one way, doesn’t mean that you have to keep it that way! The ShelfTrack Closet Organizers can fit into closets between 2-8 feet, which means that you can use them for the nursery, too. Want more? Add accessories like hanging baskets, stacking shelves and shelf liners. Personalizing your closet has never been easier. The only truly adjustable storage system out there, this is beautiful, versatile and built to last. The freedomRail offers you the flexibility and ease to change the components when you see fit so that you can fit your active lifestyle. You don’t need any tools, making this one of the easiest things to update as you please and you can transform the look and function of any storage space in your home by just moving around the shelves, baskets and changing up the hanging space. You can maximize every inch of closet space with this kit, and it’s designed to be sophisticated in your home. It’s also designed with up to 50% more steel than most closet organizers, which keeps up with active families. Other rail based systems use a lot less steel and don’t have the same level of adjustability. While we’re on the topic of strength, it can also hold 100lb of weight per linear foot. The installation is quick and easy, and the Rail is attached to the wall to make for easy hanging. There are seven on trend finishes that match any decor in the home, so all you have to do is choose where it goes. Designed with style and Sophistication, freedomRail is truly adjustable. 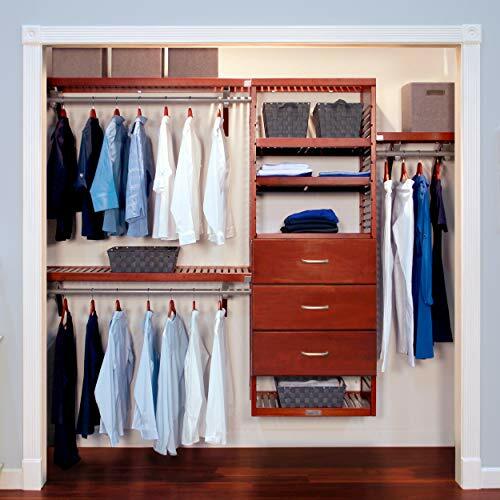 Transform the look and function of your reach-in or walk-in closet in an instant! Premium components offer an elegant, on-trend appearance that lasts. 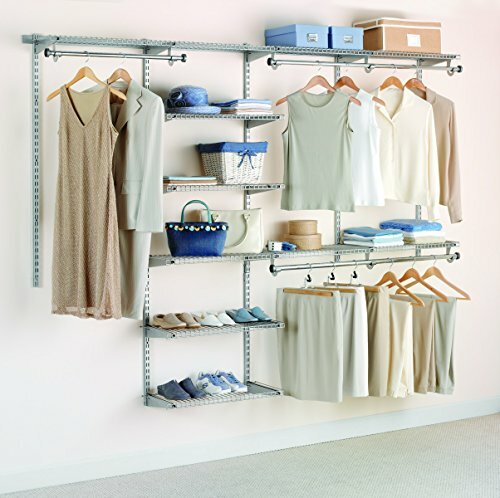 Continue to add and modify with freedomRail accessories as your wardrobe and storage needs change. Quality-engineered to hold more weight than other rail-based Systems - holds 100lbs per linear foot. Heavy-gauge steel parts and wooden shelving provide extreme dependability while complementing your style. Quick and easy installation - everything hangs from the horizontal rail. Simply slide the uprights along freedomRail for a truly adjustable storage solution. 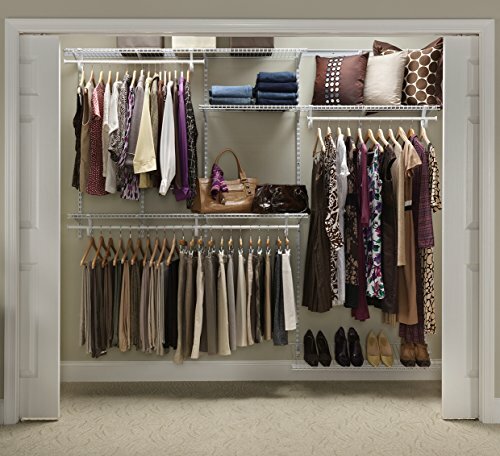 You can really maximize your storage for space when you have 16 inches of deluxe closet organizer to work with. You get 3, 10 inch drawers while also getting an abundance of shelf storage. You won’t ever have to be disorganized again, and it’s not just for clothes, either – you can use this for your coat cupboard for guests, the nursery and the children’s bedrooms. Your drawers offer you a way to have a distinctive and stylish way to increase your organization skills and the drawers also feature felt lined drawer bottoms and a soft close full extension with ball bearing glides. Everything you need is in one box, and this solid wood closet organizer gives you the chance to transform a space stylishly and quickly. With up to 22ft of space, you can organize your things in any way that suits you. Not happy? Change it all up, because you can move it all around a you see fit. Includes 3 - 10 inch drawers featuring soft close full extension ball bearing drawer glides, Satin Nickel handles, and Felt lined bottoms. Neatly arrange everything in your closet with this Expandable Closet Organizer. It’s reliable and looks great, featuring a steel wire construction with either a black, chrome or bronze finish. You can use this in a walk in closet, a room without a closet or pretty much anywhere in or outside the house where you need extra storage space. The stylish design means that it can fit in pretty much anywhere, and whether you want it for seasonal clothes or year round options, it’s the perfect, versatile item for your house. The four extra wide levelling feet increase ground contact and promote enhanced stability. There is also wall mounting hardware that come included for added safety. For the closet organization that makes sense for you, there are 2 adjustable hanging rods that can be moved up and down an inch at a time, so you can make it suit you and your tastes. 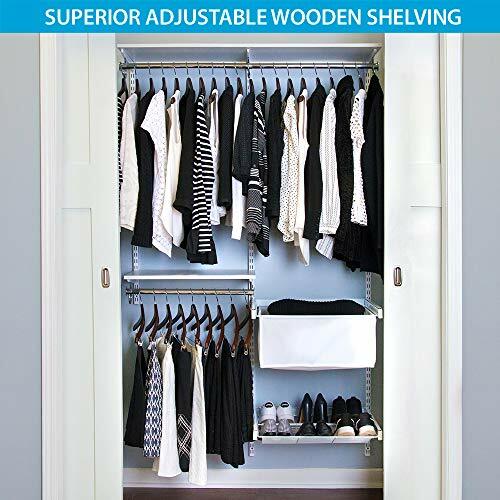 There are 10 adjustable height shelves, 5 on either side and each shelf holds 100lb, so you can really organize your clothes and coats in a way that works. Thankfully, there is a simple screw together assembly and it doesn’t take long to put together. This closet organizer includes plastic shelf liners and wall mounting hardware, and it’s backed with a 1 year limited warranty. There are many people that dream of an organizational overhaul , but we mostly don’t have the time to get it done, which means you need to utilize as many closet systems as possible without sacrificing the space you have. When you only have a hanging rack and maybe a shelf or two, it can be hard to keep everything in order. The benefits of closet organizers is that they provide your storage space with a home for everything. Not only are closet organizer systems good for your organization sills, they’re going to help you to feel better, too. The more organized and efficient you are, the better you feel as you go about your daily routine. You can start seeing the benefits of your closet system immediately, and instead of trying to cram in just one more thing to your closet, you can enjoy the benefits of a well thought out system that makes sense for your own peace of mind. You staying organized allows you to be efficient in the morning, so there is much less of a rush day to day. The right closet system also brings value to your home; the built in options are going to bring you extra cash when you decide to sell one day!